My latest article for The Ecologist website is about aerotropolis projects: Aerotropolis alert! Airport mega-projects driving environmental destruction worldwide. An aerotropolis is airport centric urban development. Established and new airport are surrounded by commercial development which is designed to be aviation dependent. Greenfield (undeveloped) sites are preferred, inevitably entailing the loss of farmland and displacement of rural people, or the destruction of vast tracts of wildlife habitats including forests. Communities are largely excluded from planning and governance of aerotropolis projects, while corporations benefit from infrastructure provision and incentives including tax breaks. Nearly two months ago I was pleased to announce the launch of the Global Aerotropolis Movement (GAAM). 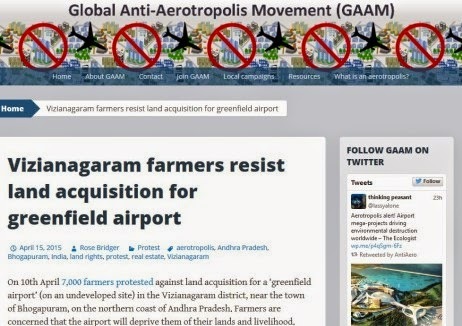 The GAAM website already has a few blogposts about aerotropolis schemes around the world, including in Cairo, Istanbul and Bhogapuram in Andhra Pradesh. A list of articles that are critical or the aerotropolis, both the concept and specific projects, is building up, to start to counter the deluge of industry information that presents the aerotropolis as an economic panacea. As well as checking out the website you can follow GAAM on Twitter and 'Like' the GAAM Facebook page for regular updates about aerotropolis projects and local campaign groups.